I made this Cinnamon Coffee Cake brunch recipe as part of a sponsored post for BAILEYS® Coffee Creamers. My grandmother used to always tell people that they needed a “sugar lump” to go along with their coffee as she served them some of her delicious baked goodies. And I have to say that I agree and when serving brunch for guests, coffee cake is the perfect sweet treat to finish off the meal! 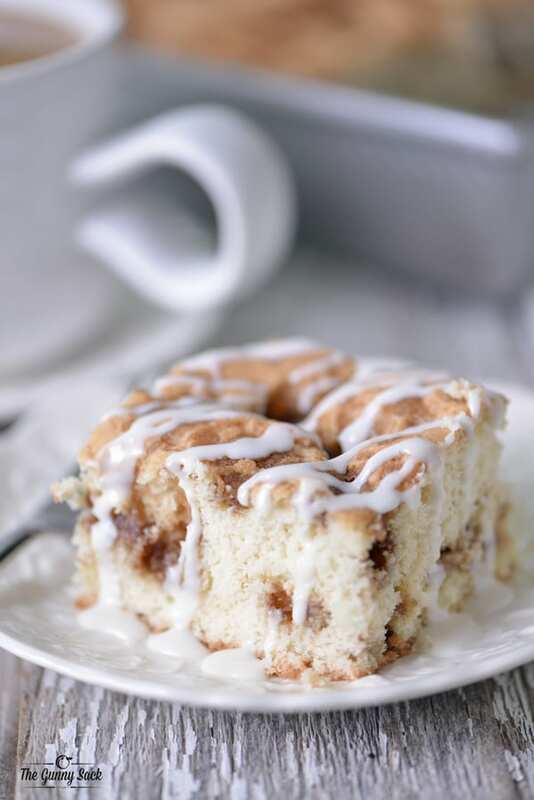 There’s nothing better than enjoying a cup a hot coffee with a slice of something like this fantastic Cinnamon Coffee Cake. I served this coffee cake when we had friends over and everyone absolutely loved it! Want to know what the secret ingredient was? I added BAILEYS® Coffee Creamer Vanilla Brown Sugar to the cake! This was my first time trying the vanilla brown sugar flavor of BAILEYS® Coffee Creamers and as soon as I opened the bottle, I knew I was going to love it from the smell alone…it’s delicious. Although the vanilla brown sugar flavor is perfect for this cake, you could substitute it with any of the 14 flavors of BAILEYS® Coffee Creamers. 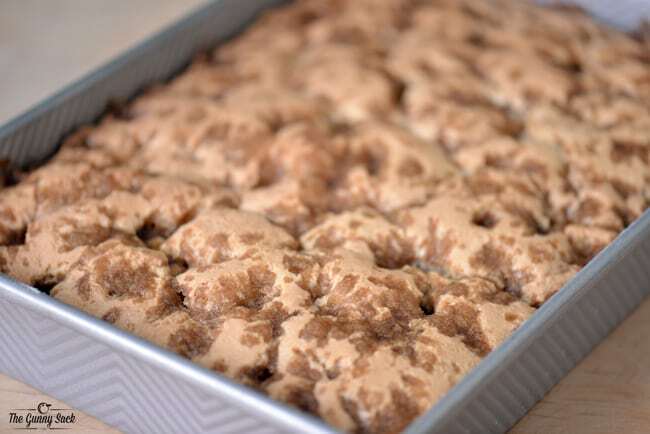 This coffee cake is really easy to make. Mix together the flour, sugar, creamer, buttermilk, butter, eggs, baking powder and salt. Mix on low until combined and then beat for two minutes. 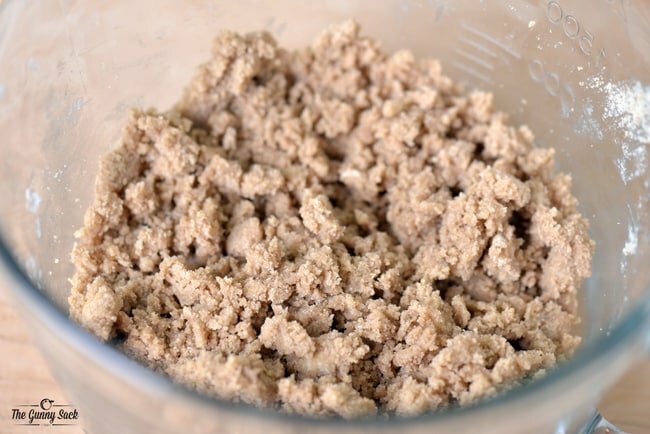 In a separate bowl, combine brown sugar, flour, butter and cinnamon with a pastry cutter or two knives until clumps form. Spread half of the batter in a greased 9×13 inch pan. Sprinkle the batter with half of the cinnamon streusel. Add the remaining batter and carefully spread it out. Sprinkle with the remaining streusel. Bake at 350 degrees for 35-40 minutes until a toothpick inserted in the center comes out clean. Finally, make a simple frosting to drizzle on the cake by mixing together powdered sugar and BAILEYS® Coffee Creamer Vanilla Brown Sugar. This cake was so delicious while still warm, right out of the oven, but it was also fantastic when I served it to my friends the next day. After allowing the cinnamon coffee cake to cool, I covered it and put in the fridge overnight. Before serving it, I warmed the cake up for a few minutes in the oven, at 350 degrees. Every last scrap of this Cinnamon Coffee Cake disappeared and everyone, from the kids to the adults, loved it! Mix together the flour, sugar, BAILEYS® Coffee Creamer Vanilla Brown Sugar, buttermilk, butter, eggs, baking powder and salt. Mix on low until combined and then beat for two minutes. 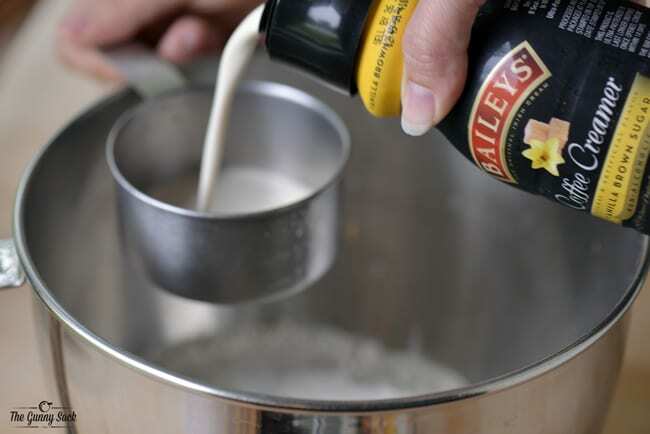 Mix together the powdered sugar and BAILEYS® Coffee Creamer Vanilla Brown Sugar. Drizzle over the coffee cake before serving. This looks like a delicious recipe and I can’t wait to try it, but do I need to use the coffee creamers? Can I just use milk instead? The coffee creamers bother my stomach. Yes, you could use regular milk. I would suggest adding some vanilla too. Best of luck! I love to use different coffee creamers in my baking! I will have to look for that flavor because holy cow, that coffee cake looks and sounds amazing!!! This sounds great… however I have a question: the recipe calls for baking soda and the instructions state baking powder. Will you please clarify? Thanks for sharing. It sounds great! Thanks Crystal! It’s baking powder, I’ve updated the ingredients list. Love the addition of Baileys.. This looks amazing .. I can’t wait to try it!! Gah!!! This sounds perfect for the weekend! My MIL is coming into town and I know this would be a hit!! Bailey’s? BRILLIANT! What an awesome addition! WOW! This is exactly the coffee cake I want to wake up to!!! There is nothing better than cake. Really, but crumble cake?. Even better. Coffee cake is the best – cake that’s appropriate for breakfast, so awesome! This coffee cake looks amazing! wow this coffee cake looks fabulous, I am very impressed, and that streusel topping, an the Baileys creamer such a nice addition! 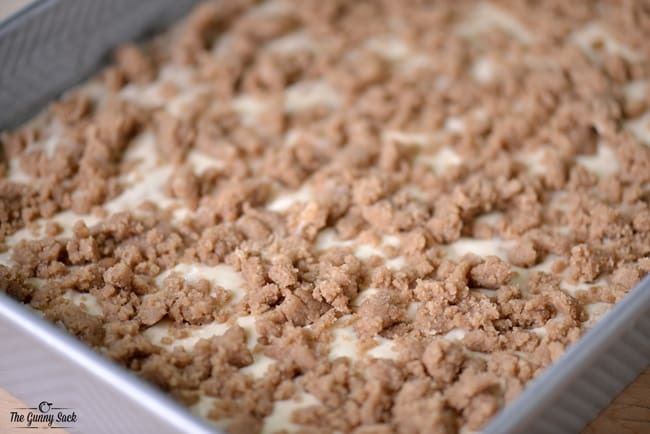 Coffee Cake is one of our go to desserts in the fall! Its delicious at night with a cup of coffee or in the morning. Basically all day! And I love the crumble that you have in this one! Delish! Pinned! I love a good coffee cake; but this being made with BAILEY’S?? That makes it GREAT! I’m drooling! I LOVE making coffee cake, since I’m terrible at regular layer cakes! This is right up my alley! Pinned! Mmm, I LOVE all that baileys you got going on in this cake! Wish I can have a piece of this! Coffee cafe made with Baileys, well that’s speaking my language! 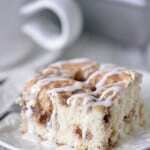 It has been too long since I’ve had coffee cake; will need to try this for a Sunday brunch soon! Coffee cake is my favorite cake ever, and I can’t even imagine how good this one tastes with that Bailey’s creamer in there…YUM!! This coffee cake looks fantastic! I love how you used coffee creamer in it too. It’s great seeing recipes with coffee creamer as an ingredient because it’s great to know you can use it for more than just coffee! Thanks Howie! No, it does not contain alcohol. It’s regular coffee creamer. Wow! This looks amazing. I love the addition of Baileys. Pinning! I couldn’t pin this fast enough! I am such a sucker for all things cinnamon and all things coffee cake and this my friend, takes the cake (lame pun intended)! Great idea adding the flavoured coffee creamer to the recipe!! Looks amazing! This sounds so delicious!! I’m not one for flavored creamers in my hot coffee, but I love sweetened flavored ice coffee! Weird I know! 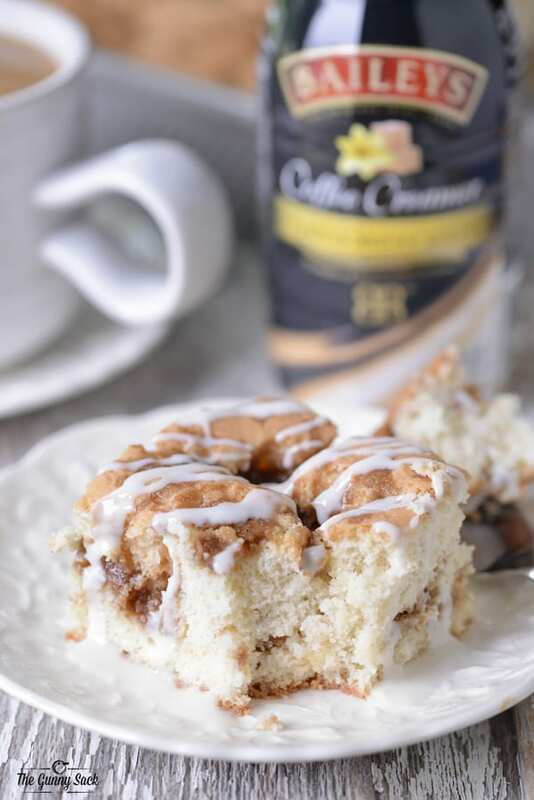 I’m definitely going to give this coffeecake and the creamer a try!! I love a good coffee cake! This looks delicious. Thanks for sharing! What a great idea Tonia! 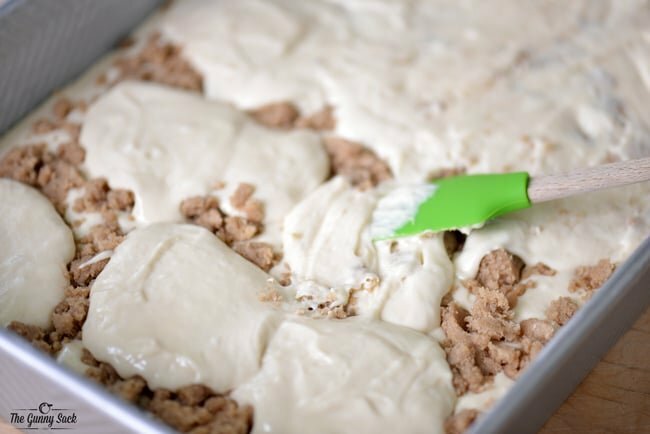 Adding coffee creamer to coffee cake. It’s like a no brainer but I never thought of it. These pictures are gorgeous and now I am totally craving cake! I love a good coffee cake! I love the baileys drizzle!